The next time someone asks you "Why should I hire you for your dream career?" or "What are your credentials?" imagine being able to say: "I am a trained professional with a certificate from the International Association of Professions Career College." You will also have access to a Faculty Member to give you advice to help you succeed in the course and the career. 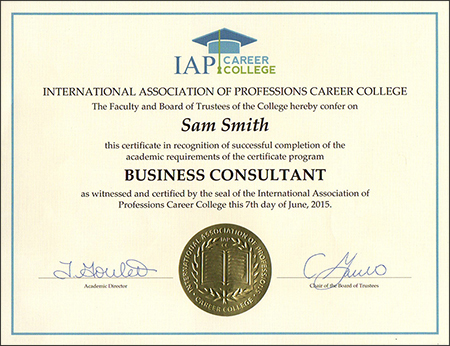 Once you have completed a course, you will have a beautiful certificate personalized with your name and the seal of the International Association of Professions Career College to show to your potential employers or clients. We invite you to learn more about our fabulous courses by clicking on the “Certificate Courses” link above. The textbooks for all programs are from FabJob Inc., the leading publisher of guide books on how to get started in a dream career. As a student of IAP Career College you are eligible to join a professional association for your dream career for only $2 per month in 2019 - 2020. Choose from dozens of professional associations affiliated with the International Association of Professional Organizations (IAPO). To find out more about joining one of the IAPO professional associations, click on the "Professional Association Memberships" link above. Contact an Academic Advisor at International Association of Professions Career College by email at iapcollege@fabjob.com or phone 1-888-322-5621 toll-free in North America or 1-778-383-9772 from anywhere in the world. Learn how you can earn a professional certificate for your dream career in only 6 weeks part-time online.